How do I Video Call | How do I Video Chat : Android, PC, Facebook, Skype.. | Free Pc to Phone Calls, Free Voip Calls to India International ! How do I Video Call | How do I Video Chat : Android, PC, Facebook, Skype..
At Free Pc to Phone Calls, we have already covered so many different ways you can do a video call with your friend. However it becomes difficult for people to search and read each and every post! So we thought to make a consolidated list of some of the video calling application or some ways on how you can make video calls or Video Chat with a friend. 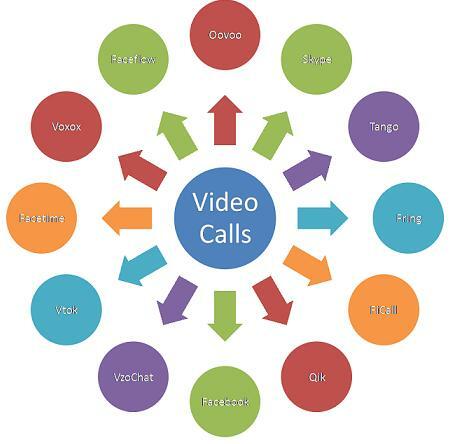 Voip and Video calls have just taken over the telecom market. People no longer want to pay heavy on their phone bills. What we want is free calling, rather free video calling. Well why not, with internet on PC, internet on mobile : this should not be a problem. Skype on PC was already so much popular, and now people can easily make video call on Android, iPhone, Gmail, Facebook! In simple words, if you have internet (PC/Mobile/iPad/Tablet), Camera (Webcam on PC, or Front Facing Camera on Mobile/Tablet) : then you can do a video call easily. So lets look at ways on how do you make video call. OoVoo on your PC, Android Mobile, iPhone, or iPad : Oovoo is certainly one great application which can be used on your mobile or PC. Apart from normal video calling (quality is also good), it has features like Free Group Video Calling (which is just awesome, video chat with multiple people at same time). Moreover, it is Free! It is one of the very popular video calling application. Oovoo even works great on iPad. Skype for iPad, Mobiles, PC : Does it require a review. It is the leader in video calling. However we have a tutorial on how to use it on iPad. Tango Video Calls on PC, Mobiles : Just like Skype and Oovoo, Tango offer video calling facility on smartphones like Android, iPhone, and on PC. People can use Tango on their Pc to make video call to your friend using Tango on his mobile. Call quality is average (Skype & OoVoo are better). Facebook Video Chat : If you are looking for "How do I Video Call on Facebook", then we have already covered a tutorial on that. It explains how you can install video chat on facebook and make video calls on FB for free. Facetime on iPhone, iPod Touch, iPad : Well if you have an Apple device, you don't have to look anywhere else. Facetime is the best application for making video calls, but it is restricted to iOS. Facetime Alternative for PC : What if I have iPhone, but my friend is on his PC: Facetime won't work. You need some facetime alternatives. the next thing. It is popular on PC, however fring is the first one to get this on mobile. Qik for Android : Another good android application for making video calls. about the ones having windows mobile. Well we have covered a post on windows mobile video chat as well. Voxox : Free Video Conferencing on PC. It used to offer 2.5 free hours voice calls to USA as well. FiCall : Video Calls on all mobiles : Nokia, Android, Pc, Tablets. Video call quality is average. Faceflow : Another facetime alternative for android mobiles. Vtok Video Calls : Gtalk Video calls. You can sign in with your gmail id and can make video calls to your gtalk buddies for free. If you are from India and looking for video calling phone, then you better check out : "3G Video Calling Mobiles in India". So, I hope this answer your query on "How do I make Video Call" ? If not, please post your questions in the comment section. We would love to help you out!